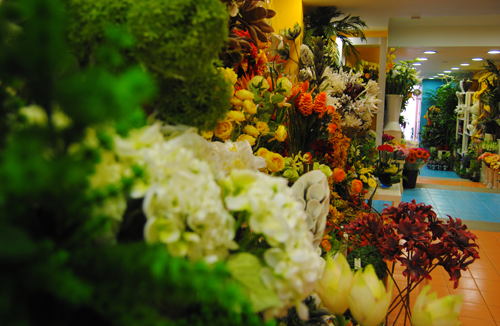 Immersed in the vibrant Caldas da Rainha city center, this store can be found in the Heróis da Grande Guerra Street for more than 30 years, Flor Viva flower shop. Easily identified (close to the BUS Station and the Mail Station) this stores’ entry is an authentic flower arrangement. Beautiful plants and flowers garnish the facade inviting you in. Accessing by car, you will have car parks on 25 Abril Square or at the Cultural and Congress Center. In addition, this shop also has delivery services so that you can place orders from anywhere in the world! Giving flowers is a gesture that makes any occasion special and unique. Its symbolism is transversal to any culture. In Flor Viva, you can find experience and innovation in a wide range of services, from simple flowers and bouquets to space decorating jobs. In the case of Flor Viva, entering the store itself can be a different experience thanks to the huge variety of products you’ll find there. If any help is needed well-taught and friendly collaborators are always willing to help you find the Perfect flower!